FEATURES * For health reason, negative ( alkaline ) water generator is used in the home and office popularly. However seldom peoples know the intensity of negative ( alkaline ) ions that are contained in the water. * NI-214 is the useful tester to measure the negative ion. * Kits with negative ion ( ORP ) probe with the meter and the carrying case. * Measurement range : 0 to -1,000 mV. * LCD display, data hold. * DC 9V battery ( 006P ). FEATURES * Professional ORP electrode with high accuracy and extreme reliability. * Silver-silver/chloride reference gel. * Epoxy body, BNC connector and 3 meters cable. * 12.5 mm Dia, x 150 mm length. * Range : -2,000 to 2,000 mV. * Operation Temp. : 0 to 65 ℃. * To cooperate ORP meter ( ORP-203, ORP-213, PH-206, PH-207, PH-208, YK-2001PH , YK-2005WA, WA-2015, WA-2107SD, NI-214 ). application for water conditioning, aquariums, beverage, fish hatcheries, food processing, photography, laboratory, paper industry, quality control. FEATURES * Use for ORP ( Oxidation Reduction Potential ) measurement in plating baths, waste water monitoring and other applications such as Aquarium, Beverage, Fish hatcheries, Food processing, Photography, Laboratory, Quality control, School & Colleges, Swimming Pools.... * Professional pen digital type ORP meter. * Range : -1,000 mV to 1,000 mV. * IP 65 water resistance, heavy duty. * Complete set with ORP electrode, ORP-14. 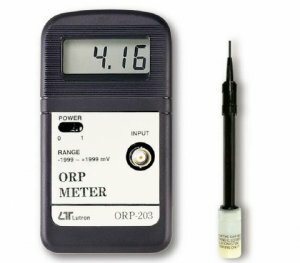 * Separate ORP electrode, easy for general purpose usage and remote measurement. * Build in reverse display button. * Data hold. * Auto power off. * Compact size, light weight. FEATURES * Use for oxidation/reduction measurement in plating baths, waste water monitoring and other applications such as AQUARIUM, BEVERAGE, FISH HATCHERIES, FOOD PROCESSING, PHOTOGRAPHY, LABORATORY, QUALITY CONTROL, SCHOOL & COLLEGES, SWIMMING POOLS.... * Range : -1,999 mV to +1,999 mV. * Resolution : 1 mV. * Easy operation, compact size. * Water resistance on the front panel. * All function keys are used the rubber button. * Large LCD display.